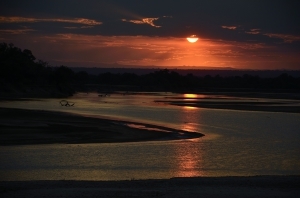 August in the Luangwa Valley consists of gusting winds, red sunsets, loads of travelling Italians and great game-viewing. I was not going to write a whole newsletter about the Italians, so I guess great game-viewing is the topic of choice. August: It’s that time of the year when winter turns into summer, bypassing spring without even a hello or a goodbye. It’s the time of the year when a well-deserved drink of water while on a game-drive turns the dust in your throat into slimy lumps of mud and as it slides down into your belly you think: “I have the best job in the world!” August in the Luangwa Valley consists of gusting winds, red sunsets, loads of travelling Italians and great game-viewing. And seeing as the latter is why we are all here, I thought this newsletter should be dedicated to some of the scenes we saw this month. Wildlife Camp’s guides worked extremely hard during August, and between the four of them (I chipped in here and there with a safari) did 174 driving safaris, 37 walking safaris and about 30 tours of the local villages. It’s no wonder then that we have many stories to tell. 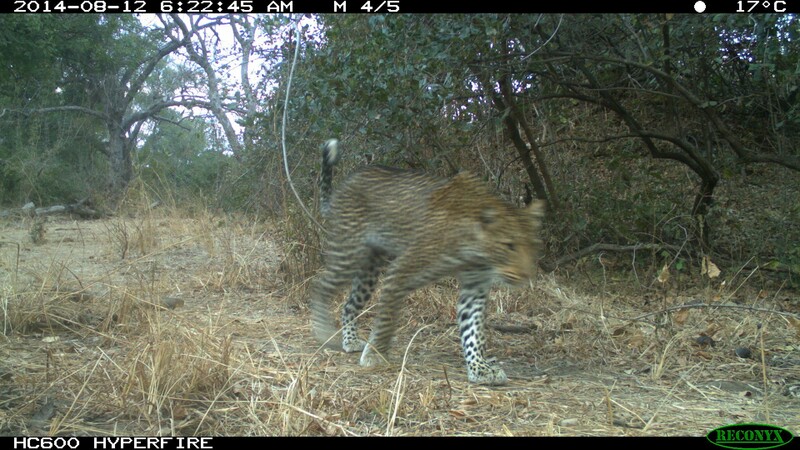 Living next door to Alice… Alice is a female leopard sometimes seen on game-drives and by far South Luangwa National Park’s most famous occupant. The fact that she is supposed to by a shy and elusive leopard is completely lost on her and she often flaunts her two cubs to anybody willing to stop and take a photo – and willing guests are not hard to come by. 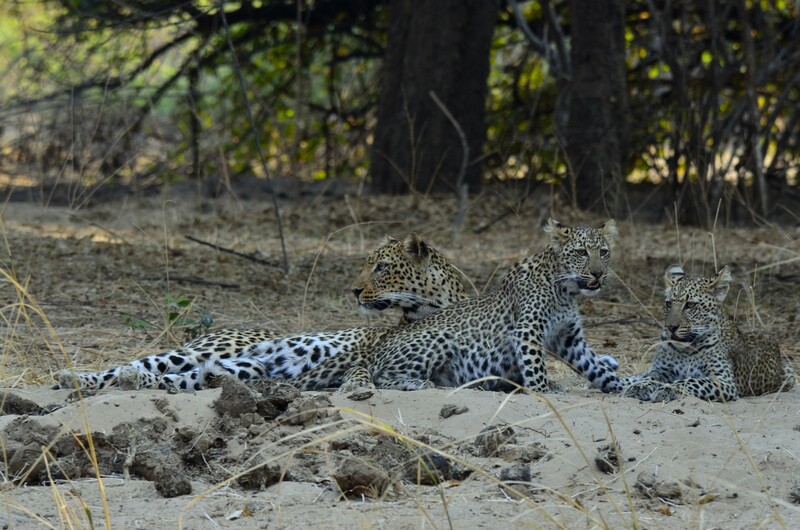 She has been brilliant for game-viewing and our guides have really enjoyed watching the two cubs grow into the beautiful spotty teenagers they are now. They are already very active and has often surprised me with their boldness – to them, safari-vehicles are merely props in their playground and hyenas a source of humour. It’s been absolutely fantastic to see them develop from kittens into cats in front of our eyes, and we hope that they will go all the way and become healthy independent adults themselves. 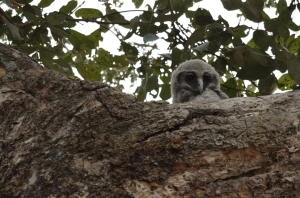 Another mom that has been proudly showing off her chick is the Verreaux’s Eagle Owl in the rain-tree near the main gate. A while back we started seeing the little ball of feathers, often peaking down at us from the safety of his nest. To be honest, at no time during his younger weeks was he not ugly. But ugly can be adorable as well. Giant-Eagle Owls (as they used to be called) incubate their eggs for 38 days with the female taking sole responsibility. The male does chip in by bringing food for the female and chick at night. Lately we’ve been seeing the chick flapping his wings vigorously, probably in attempt to learn the ancient art of flying. But for now he is still nest-bound and always keen to pose for a photo or two. You often find mom perching in a tree nearby and the two calling each other, as if attempting to play marco-polo. 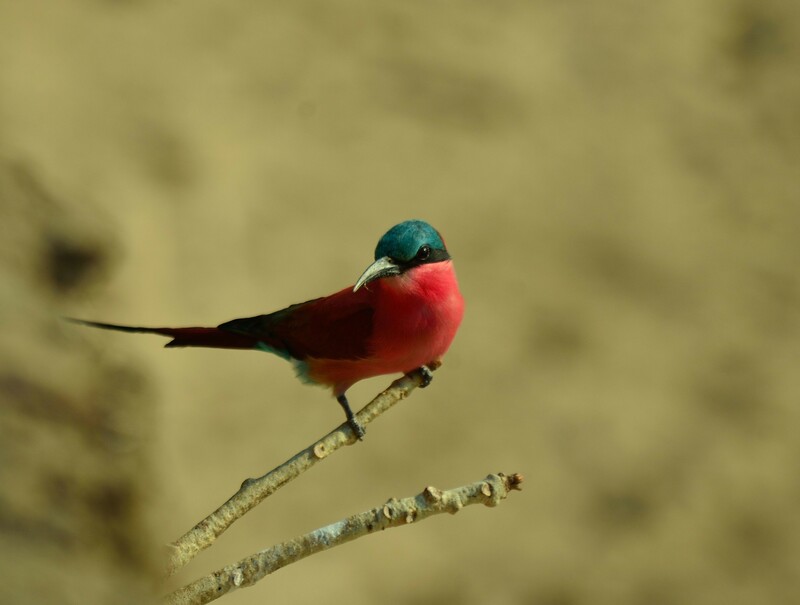 Speaking of our feathered friends and flight, the Southern Carmine Bee-eaters have arrived in Zambia and is frantically busy preparing their nests in the sandy riverbanks of the Luangwa. 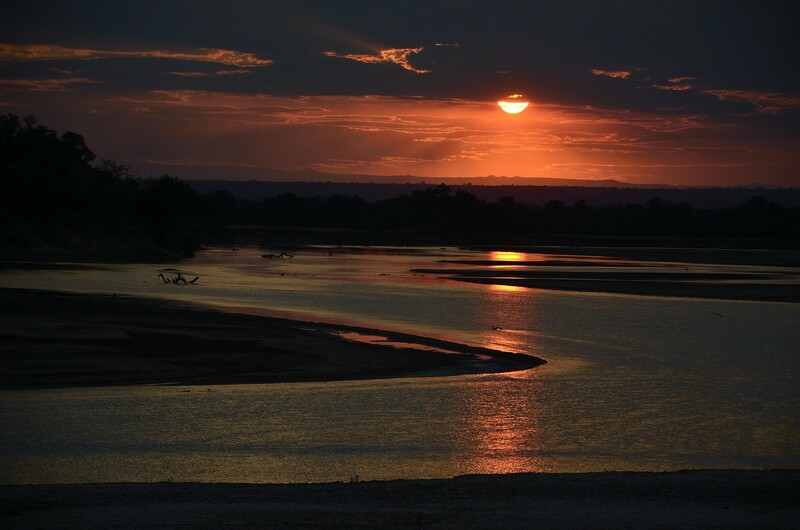 These intra-African migrants arrive at their breeding grounds late August and often dig holes of up to 2meters in river banks in which they lay their eggs. They are extremely gregarious and flocks of thousands can sometimes be seen decorating the blue sky with specs of carmine and pink. We are very excited about their arrival this year, as it looks like they’ll set up shop right in front of our Bushcamp. Carmine-bee-eaters have been known to move nest-sites, so we are holding thumbs that they won’t. 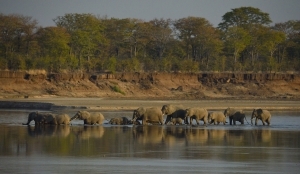 Another spectacle that becomes common as the bush gets drier is elephants crossing the river. 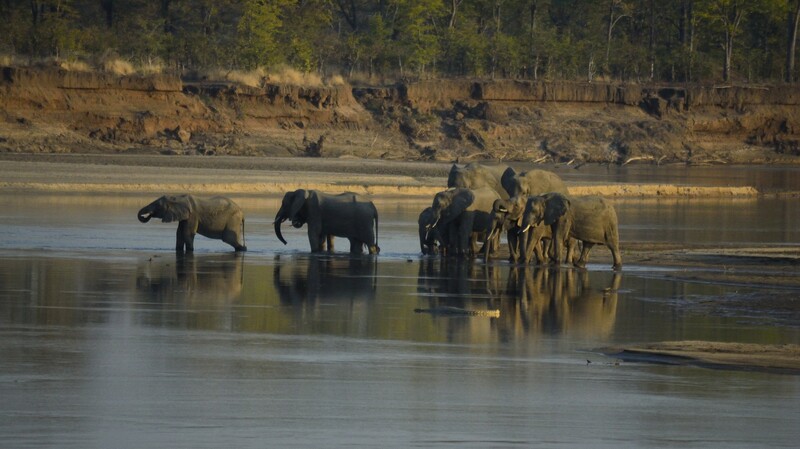 There is something romantic, and maybe even hypnotic about a herd of elephants walking through the water. As soon as the trunks and the tusks appear out of the bush in front of camp, there is usually much excitement among our guests, especially the ones new in camp. It is almost like when the movie-previews start, and everybody in the cinema shuffles around – some switch off their cell-phones while others send last-minute messages. Mothers tell their kids to stop babbling and dads glare at their teenage daughters and the new boyfriends sitting next to them. When the elephants start crossing, it is as if the movie starts. But a Gin & Tonic works better than slush puppie. Dad whispers something in mom’s ear… “I think the elephant with the one missing tusk did it.” The teenagers secretly hold hands. Everybody is transfixed by the “movie” even though the plot is quite obvious. 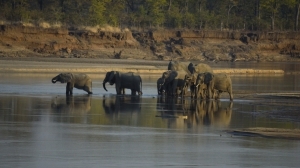 As soon as the last elephant steps out of the water, everybody will get up and go on with their daily business. Dad chases off the monkey that wanted to steal his popcorn. Mom makes a head-count of all the kids she is responsible for… and the kids start tweeting about what they just saw because, after all, Wildlife Camp provides our guests with free wi-fi! 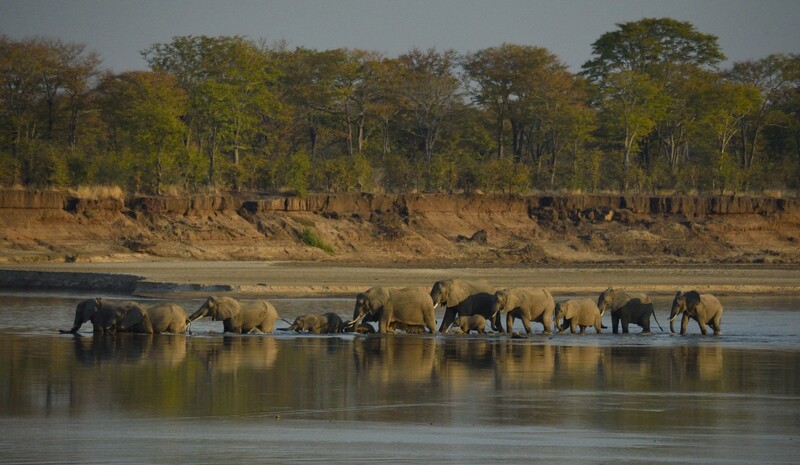 Elephant crossings are always spectacular, and there are few better places in Zambia (or Africa!) 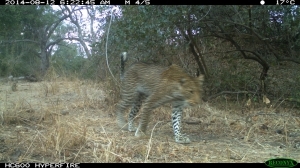 to see one than right here at Wildlife Camp. Now, where are those elephants we were trying to avoid? That is all for this edition of Wildlife Camp’s newsletter. As always, thanks for the great feedback! Ps: With this newsletter still saved as a draft on my computer I set out on another walk, and was lucky enough to see my two cubs again! 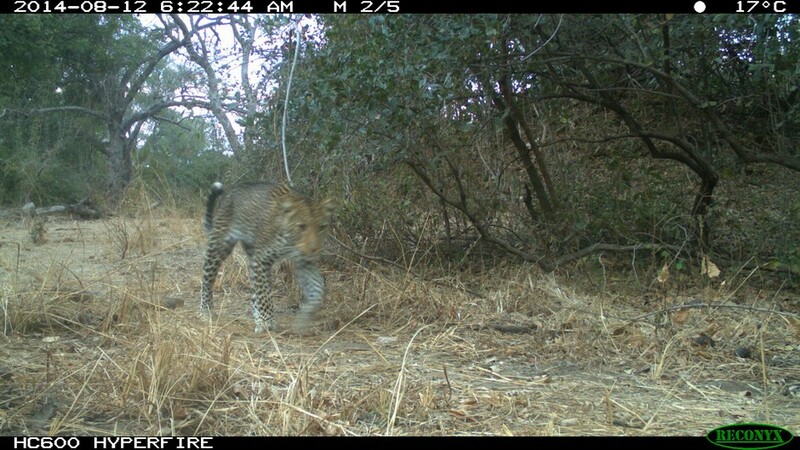 Mom was not around and so for about five minutes they entertained us (naturally we kept at a distance far enough not to put them under any kind of stress) Our motion-censor camera has also been up in that area, and even though mom has walked past before, the cubs have not yet been caught on camera.